Amid a global shortage of injectable inactivated polio vaccines (IPV), a new inoculation regimen, employed by governments in the South-East Asian region, involving two fractional vaccine doses – each about a fifth of a full dose – provides the same level of protection against all polioviruses as does one full dose, the United Nations health agency said today. According to the World Health Organization's (WHO) Regional Office for South-East Asia, the evidence-based intervention ensures continued protection of children against the virus and also helps save vaccine. This method was first used in India in its provincial vaccination programmes in early 2016 and is now being scaled up nationally. Sri Lanka and Bangladesh have also decided to introduce the fractional IPV doses this year, and other countries in the region are considering a shift in their immunization routines. The first of the two fractional doses is administered to infants at the age of six weeks, followed by the second at the age of 14 weeks. According to WHO, South-East Asia is also its first region to complete the polio vaccine switch from the traditionally used trivalent oral polio vaccine (tOPV) to the bivalent vaccine (bOPV) to prevent any paralysis caused by type 2 poliovirus strain in tOPV. The crippling and highly infectious disease, polio (poliomyelitis), is caused by the poliovirus and the last case of wild poliovirus in the region was recorded on 13 January 2011.
WHO certified the region (comprising Bangladesh, Bhutan, Democratic People's Republic of Korea, India, Indonesia, Maldives, Myanmar, Nepal, Sri Lanka, Thailand and Timor-Leste) as polio-free in March 2014. 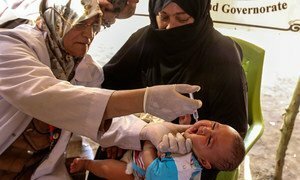 Two United Nations agencies will support the Iraqi Ministry of Health in marking World Polio Day by launching a weeklong nationwide campaign to immunize Iraq’s children against the infectious viral disease.